Fireweed RV has been the shop I take my Fleetwood Class A motorhome to for a year and a half now, and I've consistently been very happy with the work they've done (including various electrical issues on the RV and toad, slide maintenance and roof repairs), and the prices. Located along the Alaska Highway just 10 miles south of the Whitehorse Airport and downtown, Fireweed RV Services is available for all of your RV repair and accessory needs. 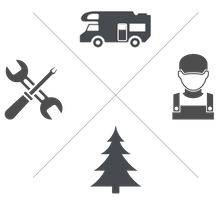 For more information about our RV maintenance services, or if you would like to inquire about a specific part, give us a call or send an email using the form provided on this page. Coming from Whitehorse, drive south on the Alaska Highway. After you see the turn off to Mount Sima Ski Hill you are a kilometer away from our location. Turn left off the highway after Pioneer RV Park. Coming from the south your first gas station is Petro Canada. Turn right on the first road after the gas station and turn left onto Lorne Road.